from their construction to the present day or their date of demolition and what replaced them. and builders of them and some of the people who lived in, or used, them. some major types of buildings such as churches and schools. Peter Coulls, Barry Franklin, Michael Pearson and Margaret Rushton. The book has 288 pages, 210 illustrations (40 in colour) and six maps. 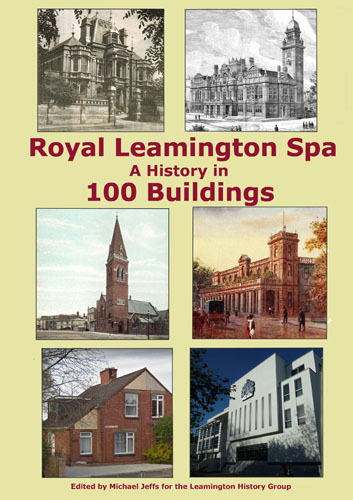 The book was launched at the Leamington History Fair on 22nd September 2018. The cover price is £20. The Group is very grateful to all those who have supported the production of the book during a long period of production; around 40 members and several other residents have made contributions in some way. By contacting Margaret Rushton at rushtonmm1860@gmail.com. … In 1923 the Council put forward proposals for the building of 260 houses on Rushmore Farm, the only problem was that it was not yet in their ownership. The Council made their first offer to the owner, Mrs Willes of Newbold Comyn, in October 1923, but were turned down. Negotiations continued and were finally successful with the whole 50 acres on either side of the Great Western Railway line being acquired for £5,500, including Rushmore Farmhouse and buildings and a small bungalow which stood in what is now Scott Road. After lots of discussions they opted to build a type of house known as a “Leicester” after a visit to Leicester to see their Council Houses. In 1922 an architect named Arthur Wakerley of Leicester had designed semi-detached houses that could be built for £299 each. The design was different to previously built mass housing in that each pair of houses shared a pitched roof and that the entrance door was at the side of the house rather than at the front. … Around 1836, the noted architect, William Thomas, began to develop parts of North East Leamington including Holly Walk, Willes Road and Lansdowne Circus. He designed a series of houses for different income groups. Semi-detached properties for the moderately wealthy, detached villas for the wealthy and immense and elaborate villas for the very wealthy. … Around 1830 the population of Leamington Priors was only about 6,000 but the Commissioners agreed to build a new Town Hall in High Street, or London Road or the Turnpike, as it was earlier named. This was on the south-west corner with Althorpe Street. The site, on land owned by the Earl of Aylesford and the Wise family was close to a pond on the Whitnash Brook as it ran along High Street where there had been three thatched cottages just to the south. … In 1887, a tower was erected to celebrate the jubilee of Queen Victoria. When Dr Nicholson died in 1902, St Albans ceased to be a proprietary church and passed into the care of the Leamington vicar at All Saints. In 1911, a church room was added and in 1913-4 the chancel was extended another three feet into the nave. A hut was erected in 1920 enlarging the Sunday School accommodation. Feedback. We welcome comments and corrections and will publish some of them here.